We are a manufacturer of commercial grade retail display cases. Our showcases are built in our Owensville, Missouri facility from glass, wood, and metal. We carry a variety of standard sizes, or can design and build to almost any custom specification. We also custom manufacture all of our own LED lights for our cases. Our display cases set the standard for the industry and are engineered to withstand decades of heavy commercial use. We support the market image and visual merchandising efforts of retailers’ and brand marketers across the United States and around the world. Our cases are ideal for jewelry, sporting goods, pawn, and other luxury items like handbags or shoes. Jahabow was originally founded in 1973 in Provo, Utah. We relocated to our current location in 1976 to better serve the US both logistically and economically. Today our manufacturing, office and warehouse complex covers nearly 250,000 square feet, and we employ more than 150 dedicated, skilled associates. 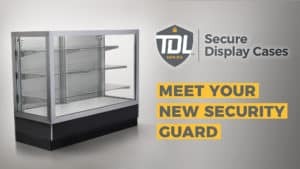 We have completed tens of thousands of custom and standard display case and store fixture projects for name-brand retailers and marketers, whether they need 1 or 1,001 of our units. Every year we manufacture and ship nearly 5 miles of store fixtures and display showcases, if placed end to end.